SAM is a performance and economic model designed to facilitate decision making for people involved in the renewable energy industry, ranging from project managers and engineers to incentive program designers, technology developers, and researchers. A working knowledge of renewable energy technologies and project finance is needed. The System Advisor Model (SAM) is a performance and financial model designed to facilitate decision making for people involved in the renewable energy industry, ranging from project managers and engineers to incentive program designers, technology developers, and researchers. SAM makes performance predictions for grid-connected solar PV, concentrating solar power, wind, biomass and geothermal power systems. Its cash flow models are appropriate for distributed energy projects that buy and sell electricity at retail rates, and for power generation projects that sell power at a price negotiated through a power purchase agreement. The model calculates the cost of generating electricity based on information you provide about a project's location, installation and operating costs, type of financing, applicable tax credits and incentives, and system specifications. SAM also calculates the value of saved energy from a domestic solar water heating system. The System Advisor Model (SAM) is software available for free download. The current version of SAM is Version 2014.1.14, released in January 2014. The SAM development team typically releases one new version each year, making improvements to existing capabilities, and adding new power system modeling capabilities. SAM models a range of renewable energy technologies for electricity generation, including photovoltaic systems, solar thermal troughs, power towers, and dish-Stirling systems. SAM also includes models for wind, biomass, and geothermal systems, and a simple thermal power plant model for comparing renewable energy projects with conventional power projects. SAM uses an hourly performance model to estimate a power system's total annual output, and a cost and financial model to calculate a project cash flow. SAM reports performance and financial metrics in tables and graphs, which can be exported for use in reports or for further analysis in other models. SAM was first developed in 2006 by the National Renewable Energy Laboratory (NREL), in conjunction with Sandia National Laboratories and in partnership with the U.S. Department of Energy (DOE) Solar Energy Technologies Program. SAM calculates a system's total electricity production in kilowatt-hours for the first year based on hourly weather data for a particular location, and physical specifications of the power system components. It then calculates the total production for subsequent years based on an annual degradation factor, and annual cash flows based on financial and economic inputs to determine the levelized cost of energy and other economic metrics. Below are descriptions of the inputs and outputs for the tool. Weather Data: SAM's simulation engine uses data from hourly weather files to model the solar resource at a given location. The weather file supplies radiation data for energy calculations, and wind speed, temperature, snow cover, and other data to model the effects of temperature and ground reflectance on system performance. 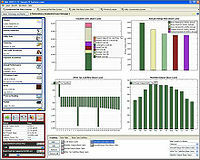 Weather data must be supplied in one of three formats: TMY2, TMY3, or EPW (EnergyPlus weather data). Financial and economic inputs: SAM's cash flow calculations depend on a set of input variables describing the projects finances, such as the analysis period equivalent to the system lifetime, discount rate, inflation rate, loan amount, and loan rate. SAM provides different financing options that use different sets of input variables. Incentives: SAM models two types of incentives, tax credits and incentive payments. Tax credits can be provided by a state or federal government. Incentive payments can be provided by a state or federal government, utility, or other entity. An investment-based incentive or tax credit is a one-time payment to the project made in year one of the project cash flow that is either a fixed amount, percentage of total installed costs, or a function of system size. A production-based incentive or tax credit is an annual payment based on the amount of energy produced by the system in each year. Incentive payments may or may not be taxable by either the Federal or state government. System performance: SAM simulates the hourly performance the power system, using algorithms developed at the National Renewable Energy Laboratory, Sandia National Laboratory, and the University of Wisconsin to convert hourly weather data into hourly AC electrical output estimates. SAM adds the 8,760 hourly values to calculate the system's total annual output. Costs: SAM calculates the cash flow and resulting economic metrics based on two categories of costs. Capital costs account for the cost of installing modules, inverters, and balance-of-system components. Operation and maintenance costs account for recurring costs for maintenance, repair, and replacement of equipment. For residential and commercial projects, SAM allows operation and maintenance costs to be assigned to specific years, which makes it possible to analyze projects with periodic inverter replacements or other periodic costs. SAM provides options for advanced analysis, including parametric, sensitivity, and statistical analysis. The model can also exchange data with Microsoft Excel workbooks to calculate SAM input variables. SAM's scripting language, SamUL makes it possible to automate complex analysis tasks and to call SAM from programs written in C, Excel VBA, and MATLAB. SAM is a sophisticated performance and economic model which enables the user to analyze a wide variety of finanancial models and PV system types. The best place to find answers about using the Solar Advisor Model (SAM) is found in the software's Help system — just click Help Contents under the Help menu or any of the Context-Sensitive Help buttons in the top-right corner throughout the user interface. You can also download the User Guide, which is a PDF version of the help system. The reference manuals describe SAM's underlying algorithms and equations in more detail. The SAM development team also provides user support through the SAM discussion group, and via email, and began conducting annual webinars in 2010. ↑ 1.0 1.1 1.2 1.3 "SAM"
This page was last modified on 14 January 2014, at 14:14.